At GIW Industries, Inc., we continuously strive to make your job easier and more efficient. After several months of advanced testing and prototyping, we are excited to introduce our new Remotely Adjusted Mechanical Suction Liner (RAMSL). Read on to discover what makes this innovation special. 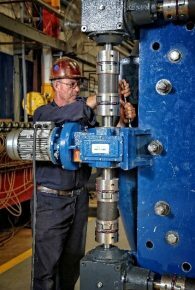 Efficient pump operation in aggressive wear applications is only possible through precise weekly maintenance. One of the key maintenance procedures is adjusting internal clearance between the pump impeller nose gap and the suction liner. The RAMSL improves this maintenance procedure for the MDX-750, which is designed to be in continuous use for five months (about 4,000 hours). According to Leo Perry, GIW Senior Engineer, “periodic adjustments to MDX cyclone feed lines historically have been made using hand tools. RAMSL allows for the adjustments to be made and monitored remotely at the touch of a button.” This makes the weekly gap adjustments much faster and more accurate. Minera Escondida reached out to GIW and asked for an automated solution for nose gap adjustments. The manual process took three or four hours per pump. And because these adjustments must be made often, it resulted in higher maintenance costs. Minera Escondida requested controls that could be managed from a smartphone or tablet — a handheld device that would perform adjustments quickly and safely, as well as increase efficiency. GIW worked in partnership with the customer to pilot the RAMSL solution and test it in the field after extensive lab trials. “GIW evaluated different options for the RAMSL, but finally decided to base the design on mechanical components in order to provide a more robust product with easy maintenance features and high operation reliability. Other options were evaluated such as a hydraulic or pneumatic design, but all of them required more complex configurations adding potential points of failure and demanding more maintenance time by the end-user,” says Mr. Palavecino. “The RAMSL user interface serves as both the control panel for the operation of the unit and as an output source for critical data taken from the pump, such as real-time vibration readings and precise movements of the suction liner (to within 0.01mm),” clarifies Mr. Perry. This product enhancement carries two primary benefits: ease of maintenance and more efficient use of time and resources. “Both benefits stem from the ability to adjust the equipment against roughly 400,000 lbs. of force from a safe distance without exerting more effort than it takes to press a button on a touchscreen,” says Mr. Perry. 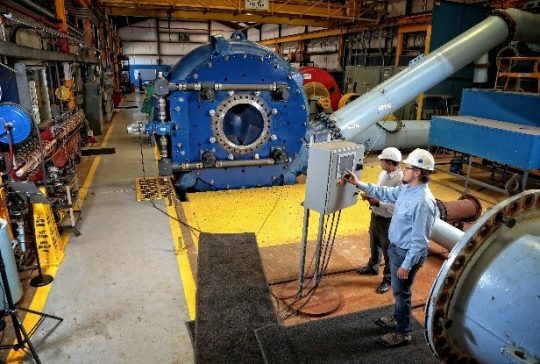 “Peripheral benefits include the ability to match maintenance schedules to best suit the needs of each pump installation.” The RAMSL can also help minimize the potential for equipment damage due to over adjustments that can be caused from traditional methods. “This was a research and development project from the beginning,” adds Diwakar Aduri, GIW Product Development Manager. This project with Minera Escondida was just one prototype, as further development work continues on the RAMSL. We are beginning to see how the collaboration of RAMSL with the internet of things (IoT), to collect and analyze data can benefit our customers in the area of predictive maintenance and inventory planning. Offering this product enhancement to other customers will, no doubt, only deepen our understanding and further facilitate the evolution of RAMSL. “GIW is committed to remaining on the leading edge of slurry transport technology. We understand that advancements in IoT are key to providing innovative slurry pump solutions,” says Mr. Aduri. At GIW, we have the experience, capacity, and solutions necessary to meet your needs in every respect. If we can assist you in any way, please contact us at 1.888.TECHGIW (832-4449) or visit us online.